You either love or hate bran muffins...or so I've been told. The haters think they're too "healthy" and full of things like raisins and grains (god forbid), but the lovers love the rich, hearty, earthy flavors. Unfortunately, most typical bran muffins aren't healthy at all: they're full of fats, oils, and sugars. So lovers and haters both, I urge you to try this recipe...because these muffins are fabulous! Essentially, they taste like a lighter version of bran muffins, but they're simple in flavor, have a great texture, and are ready in no time (and great fresh from the oven). And best of all, they're healthy and contain three different grains! 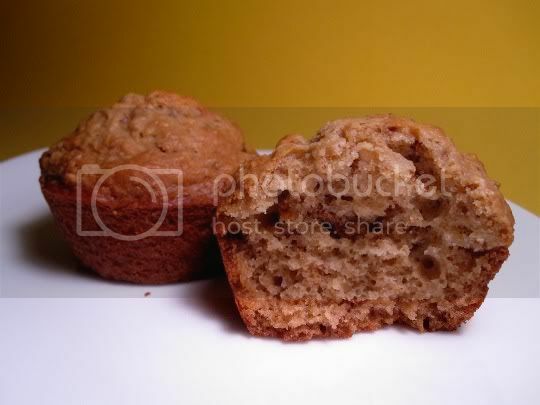 Bran flakes, shredded wheat (yes, the cereal kind), and oats make these muffins ultra hearty and chewy, with such a great texture and density...yet a surprising moistness and richness from buttermilk in the batter. Only brown sugar is used for sweetener, and it's the perfect amount: not overly sweet, but sweet enough to satisfy a breakfast or snack time sweet tooth. Fresh from the oven, they're slightly crunchy on the outside (from the bran), but super moist and chewy inside (from the oats). I quartered the recipe to only make a dozen, but feel free to make more. They store quite well in the fridge/freezer, and you'll have yummy breakfast treats for days! Make again? Yes. I feel so healthy eating these! Vegan variation: Use egg replacer and a buttermilk substitute (add a teaspoon or so of vinegar to regular soy milk).